Dave's reluctance to come back to Parkman stems from his brother, Frank (Arthur Kennedy), who tossed his brother into a boarding school when they were young so he could go off and live his own life. In the interim, Dave wrote some novels that went over like lead zeppelins and joined the military. Meanwhile, Frank married, got rich and became a respected member of the community. When Minnelli moves away from Dave's outrage at being within 50 miles of his brother to the brother himself, he clarifies Some Came Running as a work of sly suburban satire. For if Dave reacts to being in Parkman with anger and resentment, Frank responds to his brother's return with barely concealed panic, freezing with a sunken stomach when one of his customers in the jewelry store jovially tells him the good news. Whether intentionally or not, Dave soon proves his brother's fears of social embarrassment founded. With Ginny often in tow, Dave finds the cracks in this postwar, middle-class heaven and sinks into a seedy underworld of booze and carousing. Dave pairs up with a local drunk, Dillert (Dean Martin), a card sharp hellion who drifted his way to Parkman and stayed because something caught his eye. Perhaps, in his stupor, Dillert saw past the mirage and got a gander of the underbelly teeming around all the small town conservatism and social climbing. His overt loutishness, though not romanticized, is preferable to the composed behavior of Frank and his wife, Agnes (Leora Dana). At least Dillert is honest in his Dionysian irascibility. In the surface world, David goes to meet with his brother and the sister-in-law who resents him for writing an unflattering character in one of his books based on her. But before Dave arrives, Minnelli eavesdrops on the couple as they prepare for him. Agnes rails viciously against Dave for his social slight, and the hollow smile and pleasantries she foists on her husband's abandoned brother when he does show up are made that much more false and vile for showing the petty anger they thinly mask. One of the most striking elements of Meet Me in St. Louis, Minnelli's great 1944 musical, was its patience, its willingness to simply ingratiate itself with its central family without introducing conflict until late in the film. The tensions in Some Came Running are more immediately apparent, yet the director displays the same relaxed sense of narrative pace. The juxtapositions of Dave's bitter forthrightness and Frank's social posturing, and of the two distinct yet connected worlds they represent, do not produce enough conflict on their own to propel a narrative. Instead, Minnelli allows a mood to build, one of characters trapped in a constricting society, even (and especially) those who see themselves as outside it. As the narrative takes a great deal of time to unfold, Minnelli communicates primarily through his direction. Famous for his florid use of color, Minnelli tones down the brightness of this movie, casting the frame in more subdued tones that link the façade of bourgeois comfort and success with the dim underworld where Dave spends so much of his time. His fondness for framing interiors in sharp diagonals likewise generates vague, subconscious uncertainty. Not as outlandish as some other '50s melodramas that dug under the skin of postwar conformism, Some Came Running nevertheless feels most like the precursor of David Lynch's postmodern forays into the surreally stylized dark heart of suburbia. Some Came Running especially shares Lynch's conviction that the unseemly pits of thugs and outsiders are not an outlying manifestation of a "normal" community but that such normalcy is the outgrowth of that monstrous realm looking to disguise itself. Gradually, Minnelli strings out the faintest burbles of trouble. 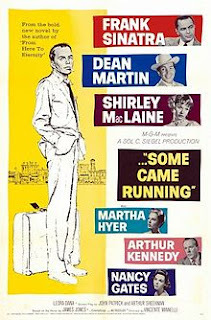 The audience gets a few pointed references to Frank's loyal—too loyal?—secretary; the loose love triangle of Ginny's unreciprocated feelings for Dave and Dave's unrequited affection for Gwen (Martha Hyer), the schoolteacher who admires Dave's writing but finds him a repulsive human being; and the emergence of Ginny's gangster boyfriend. Yet these details do not suddenly turn the film into a plot-driven vehicle, instead serving to flesh out the character dynamics and the overall sense of discontent and hypocrisy. Only at the end, in a vivid carnival sequence that acts as a showcase for the possibilities of CinemaScope, do the wisps of plot converge in a gut-wrenching finale all the more horrific for being sudden yet, in retrospect, justified. As much as Minnelli's aesthetic perfectionism guides the film, he allows the actors to truly sell these beats of social malaise and, finally, tragedy. Sinatra transfigures his eternal rakishness into defeatism, his natural cool and defiance still intact as Dave but perverted from hip loner to just lonely. When Frank makes a half-assed, condemning remark to his brother that he wishes he could say he was sorry, Sinatra places the perfect blend of contempt and regret in his reply, "Yeah, I wish you could, too." Martin, fresh off his split with Jerry Lewis, plays his typed role as the heavy drinker, but he displays his character's richness in only a few choicely parsed phrases that speak to the benign stubbornness that motivates the good-natured vulgarian. Best and most affecting of all is MacLaine, who plays her character as emotional collateral damage to the petty bickering of the film's small conflicts well before she becomes the literal collateral damage in the final burst of true danger. MacLaine holds nothing back, not checking Ginny's airiness so that when we get to see the way Dave treats her, the revelation that he never treated her nicely, that the poor girl just cannot understand even the most obvious, withering sarcasm, cannot be seen as surprising even as to see it turns the stomach. In the film's rawest scene, Ginny, at last fed up with her own cluelessness, goes to visit Gwen and practically begs the other woman to just make sense of Dave. Her blunt, ragged pain tears through Gwen's propriety and moral superiority, undermining the safety and illusion of the social game everyone in Parkman plays better than anything Minnelli does with the camera. So radical is her unpretentious, unvarnished honesty that she breaks from the suffocating surroundings where no one else can, and it is not for nothing that the seemingly loose girl who arrived in garish colors at the start of the film ends wearing virginal white in the explosion of Technicolor around her. Dave worried that the town would not accept her when they got off the bus, and he was right, but only because she represents all the innocence none of them have, and as such her moral break from the morass around her must soon be followed by a horrifying physical departure that eradicates the sole gleam of hope and humanity in either of Parkman's parallel worlds. To me this is the best of Hollywood's James Jones adaptations, and although I haven't read any of his books, when this one ended it made me want to go out and read it. I'm thinking maybe this year or next year I might read the book and then return to Minnelli's film to see how it matches up (might read From Here to Eternity, too, since I found Zinnemann's film underwhelming). I haven't seen a lot of Minnelli's work -- I have the vaguest memory of Gigi and The Barefoot Contessa, and have only seen bits and pieces of Meet Me in St. Louis whenever it's on TV -- but when I saw this one, it hit me like a body slam. It feels like something Nicholas Ray might have wanted to direct. Just the way Minnelli turns that whole town into some kind of viper's nest and makes it no better than the war was. And MacLaine's Ginny, while not too bright, is perhaps the only shining light of optimism in the entire thing. Funnily enough, the scene where Ginny goes to see Gwen is featured in the mediocre 90's Disney remake of Flubber; at one point, Robin Williams' robot plays a clip of MacLaine saying her famous line, "I want him to have what he wants -- even if it's you instead of me." I have no idea if it was Les Mayfield or John Hughes' idea to include that clip, but when I saw it in Some Came Running several years later, I racked my childhood to think back about where I had seen the clip before. Mr. Cole, what a well-crafted review of the Minnelli's brilliant drama with intense insights into the human condiction. Your revealing reflections on one of our Dino's early big screen efforts sans Jerry Lewis are much appreciated. Know that your review is being shared this day with all the pallies gathered round ilovedinomartin.